Buuut, although potatoes are far from nutritionless (they contain plenty of vitamin C, potassium and vitamin B6, for example), they’re not really the best thing to fill your plate with day after day. 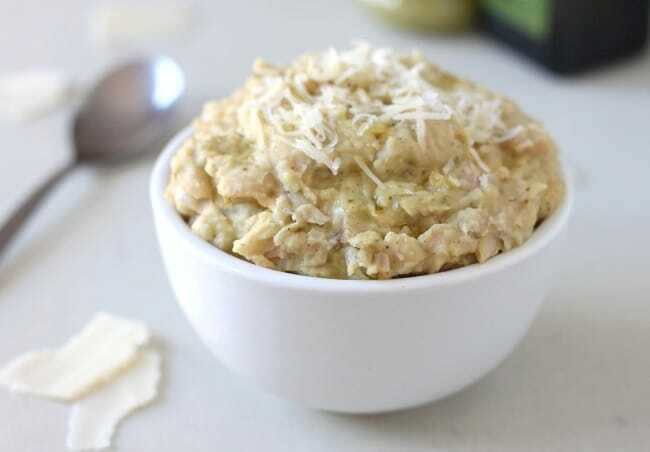 So in an effort to inject a bit more goodness into my favourite mash, I decided to make it with white beans instead. 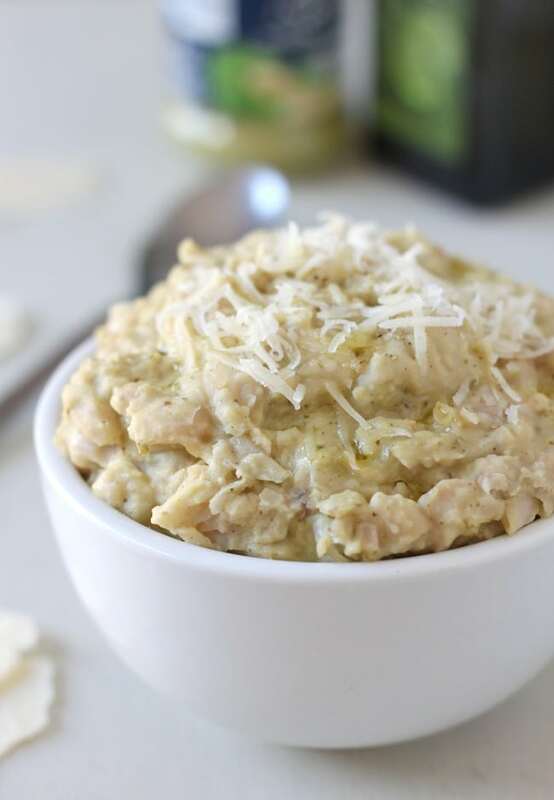 I never intended for this white bean mash to imitate mashed potatoes at all (it was meant to be merely an alternative, not an impersonator), but actually it was a really good likeness! 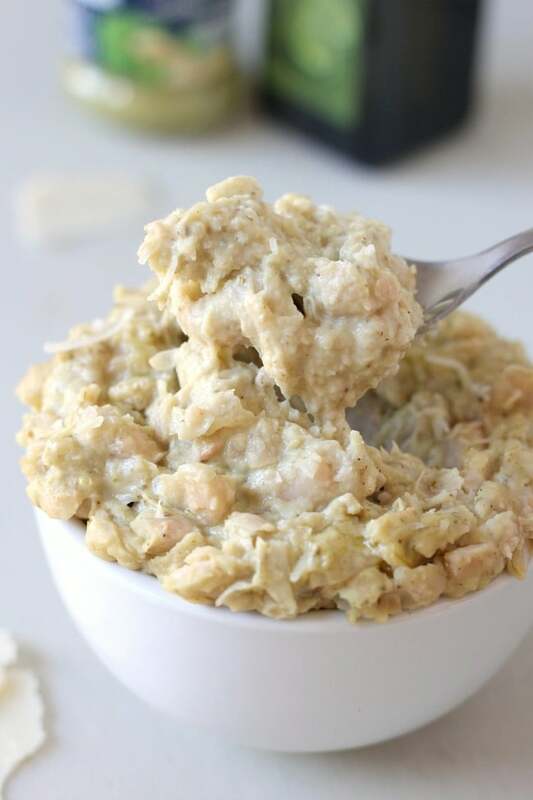 I left my beans a bit chunky for texture – there are even a few whole beans in there still – but I reckon if your puréed the mixture to be quite smooth, this white bean mash would be a really good imitation of mashed potato, especially once you’ve added the other ingredients! It definitely curbed all of my potato cravings. 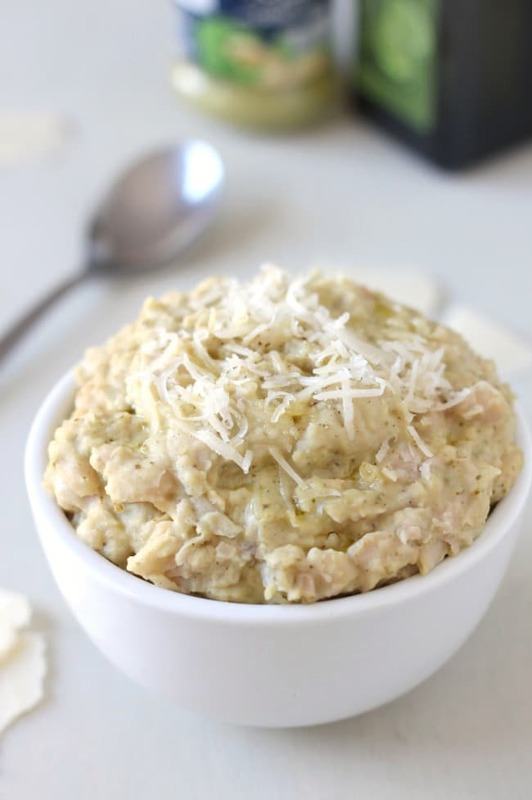 Beans don’t have a huge amount of flavour on their own (like potatoes, I guess), but just one spoonful of pesto and a handful of parmesan completely transformed this white bean mash into something seriously special – I couldn’t get enough of it! And it was really good to know that rather than just eating a big heap of carbs, I was getting some protein in me as well. As a vegetarian, it’s always handy to find new ways of getting protein that don’t just involve eating ‘fake meat’ every day (which I actually do really like, but it’s nice to have a bit of variation!). By the way – I know I’ve posted three super cheesy recipes in a row. I’m kind of ashamed (but not really, because I love cheese). I’d just like to point out that three of the four recipes that came before were totally vegan, so please don’t judge me (apart from maybe for my blog organisational skills, or lack thereof)! Add the drained beans to a saucepan with the vegetable stock, and place over a medium-low heat. Simmer gently for around 5-10 minutes, until the beans are hot and very soft. Mash with a potato masher (I left mine a little chunky for texture, but you can make them completely smooth if you prefer). Remove from the heat, and add the parmesan and pesto, along with plenty of black pepper (you probably won't need any salt unless you used low-sodium stock). Mix until well combined. Serve immediately drizzled with a little extra virgin olive oil, if desired - or, keep in the fridge to reheat in the microwave later. Hi Becca! Just made this! Amazing! Thank you for the recipe! Just made it. It tastes amazing. I think I’ll just eat it all myself. I so love my pulses and your mash makes such a welcome change from potato mash. 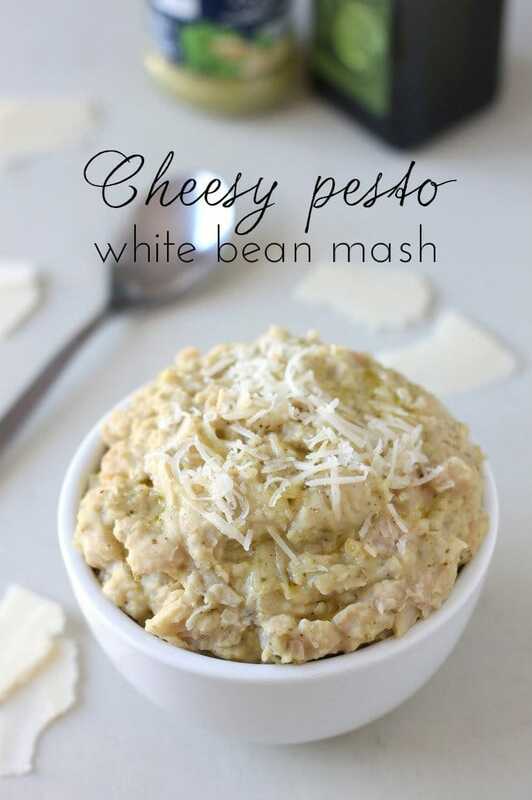 Adding cheese and pesto can only go on to make this irresistible! Girl I share your love for potatoes! This looks so delicious, and what a great idea! I sometimes make mashed cauliflower – and it’s certainly not a replacement for mashed potatoes, too. 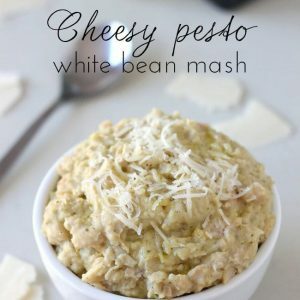 I will try this white bean mash next time! Trying to pack protein into my vegetarian husband’s diet is my biggest challenge. I thank the supermarkets daily for the never ending supplies of Quorn products, so it’s good to find your bean-tastic recipes here for some inspiration away from the pre-packaged convenience food i’m becoming far too reliant on. I’m going to have a go a both of your recipes. Clever! I love making mashed potato alternatives – I often serve Moroccan-spiced roast lamb on chickpea “mash”. Definitely going to try this! I could eat this any day of the week. I love the butteryness of the beans and with parmesan, I’d be in heaven. That looks delicious Becca. Love it. I’ll let you know once I’ve tried it. AAAHHHH! These look amazing. I’m a potato fiend too. I’m also big on beans for protein. 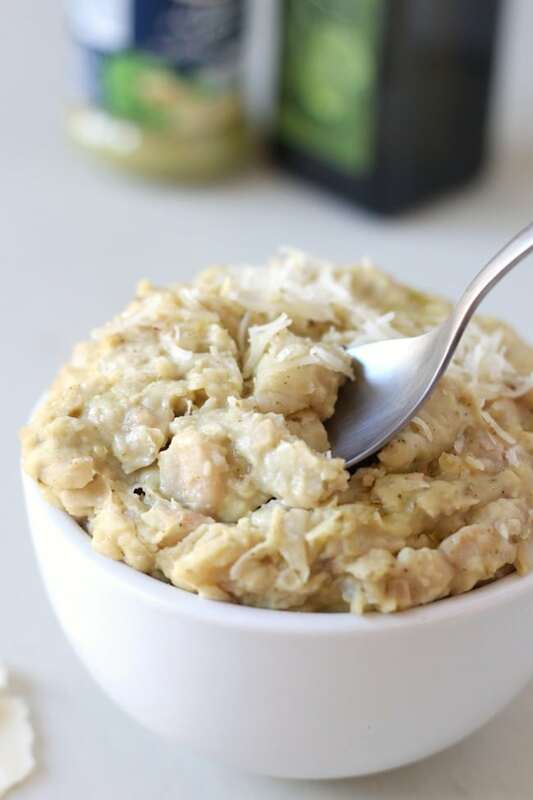 I’ve had a similar mix of ingredients as a dip, but I love the idea of them as a side dish! I think it looks quite tasty!! We like beans and are always trying to incorporate them in our diet. They are supposed to be good as far as heart and cholesterol. That is certainly a plus. Now — since we like HOT we’d probably add chipotle to it. This looks great! I actually thought it was more of a tapenade/spread at first but would be delicious either way! (I like to put anything I can on bread, it’s a sickness!